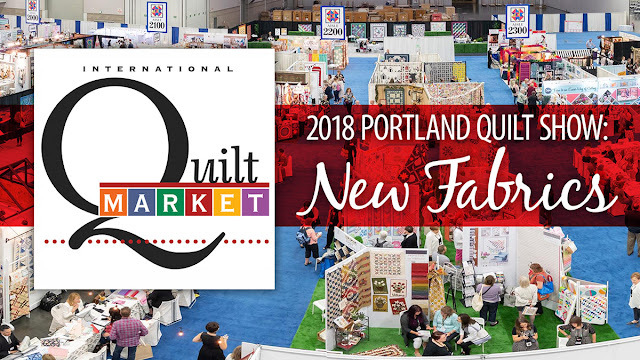 In October, when I was ridiculously busy with Quilt Market and Quilt Festival prep, I dreamed of a specific quilt. I wanted to make my Stepping Stones Cutie Pattern in Poison Purple fabrics with Acid Green background. I went to my local quilt shop, Quilt Basket, and started looking for 16 Poison Purple fabrics since all Cutie Patterns use 16 fat eighths. The shop had plenty of fabrics to choose from, but the quilt looked better in my mind. All of the Cutie fabrics in one color just fell flat, no matter how vibrant the Poison Purple was. I did what I normally do when things don't turn out the way I want them to; I screamed "Plot Twist!" and bought was the Alison Glass Road Trip collection with a Sun Print in bright yellow/green for the background instead. It had the same punch I was going for but the variety of colors/prints made it actually work! 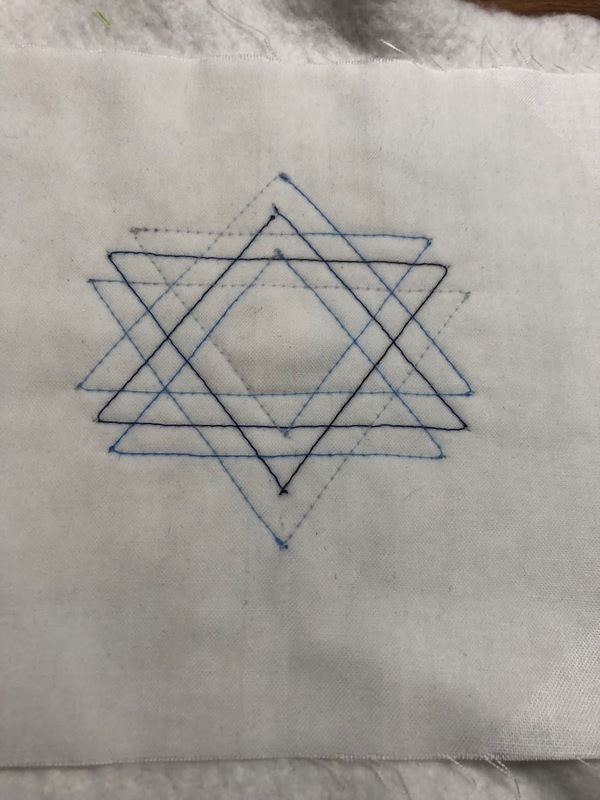 I usually quilt Stepping Stones with a lot of (wait for it....) ribbon candy quilting, but this time I wanted to see what it would look like if I only quilted straight lines using my walking foot. Well -- it. Looked. FANTASTIC! I took to heart the "lime green is a neutral" school of thought and quilted this using FabuLux Hint of Lime thread with DecoBob in the bobbin. I love how the sage DecoBob bobbin blended in with the bright pink backing fabric. Have I mentioned before how much I love DecoBob in my bobbins? I almost want to make this quilt again and quilt it with FabuLux In The Pinks, Blue Heaven, or Wisteria thread since they would have all looked great and each looked different. Sadly, I have too many other quilts in my mind (and in my quilt studio!) to remake this quilt three more times. 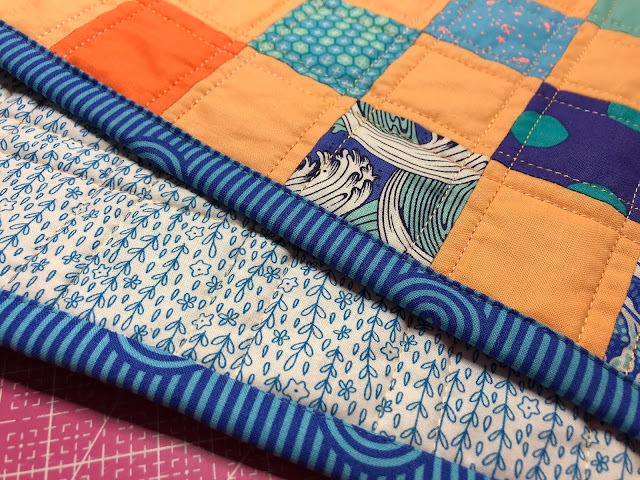 The new Cutie pattern is not back from the printer yet, but we will give directions to enrolled students so they can make the quilt in time for the class. 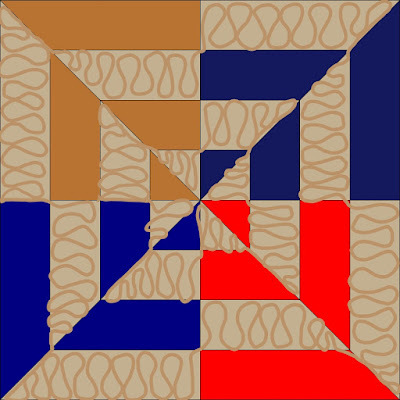 Have you ever planned a quilt in your mind that didn't look good once you saw the fabrics together? Do you scream "Plot Twist" and do something weird when things don't work out the way you planned? Even though I basically embraced the New Year mentality in the beginning of December, I am still aware that 2018 is coming to a close. 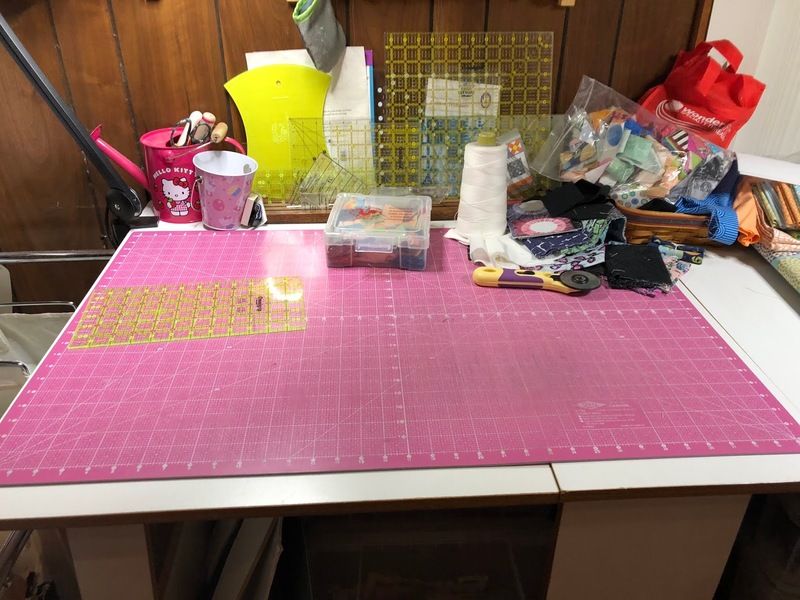 I'm cleaning my sewing room and trying to finish the projects stacked on my cutting table rather than finding new homes for them. 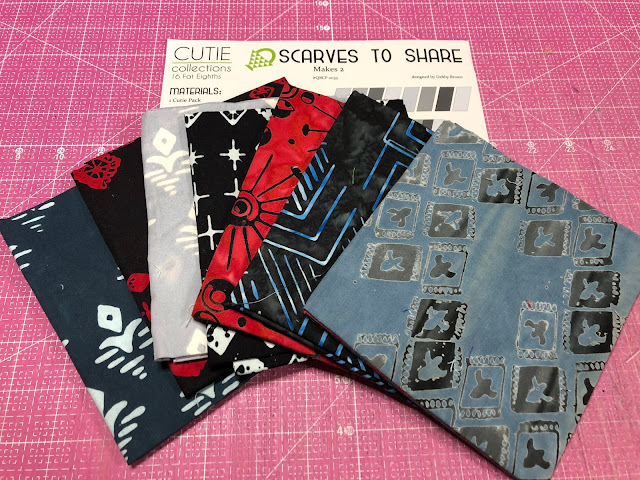 Scarves to Share using Melanie Testa's Florabunda fabrics. 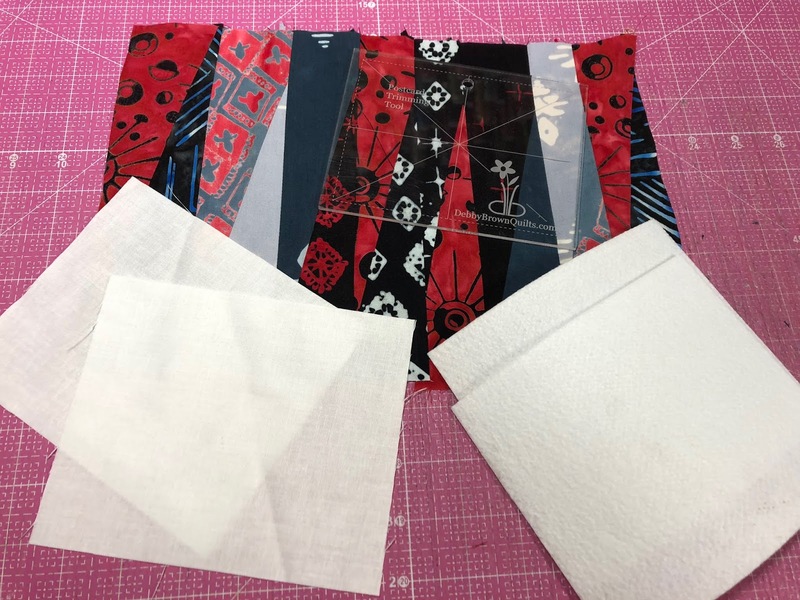 I participated in her fabric release blog hop back in June and a these fat eighth leftovers have been sitting on my cutting table ever since. They are gone now, but other projects remain. What shall I work on next? Maybe organizing my thread racks? If you want to see more of my clean(er) sewing room, check out a short FaceBook Live video I did last week. One of my goals during my time at home this winter is "Clean the Sewing Room." 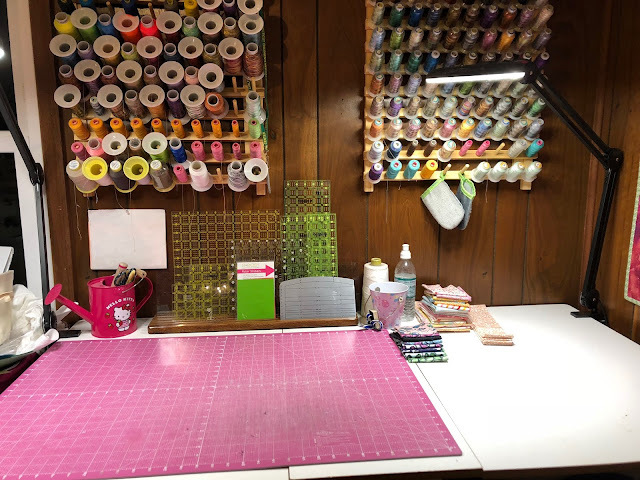 We all know that a clean sewing room is an utter impossibility, but I like to pretend sometimes. I decided to at least try to clear off my cutting surface. 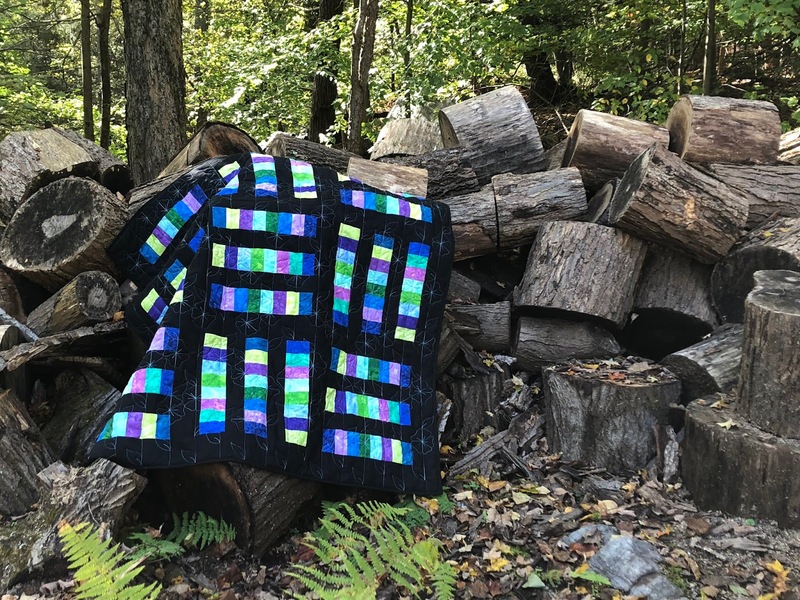 Earlier this fall, I made a quilt. I had SO MUCH FUN quilting it! How does this relate to cleaning my cutting table? Well... the scraps for this quilt have been on my cutting table since September. I decided to make something out of them just to make some space on the table. 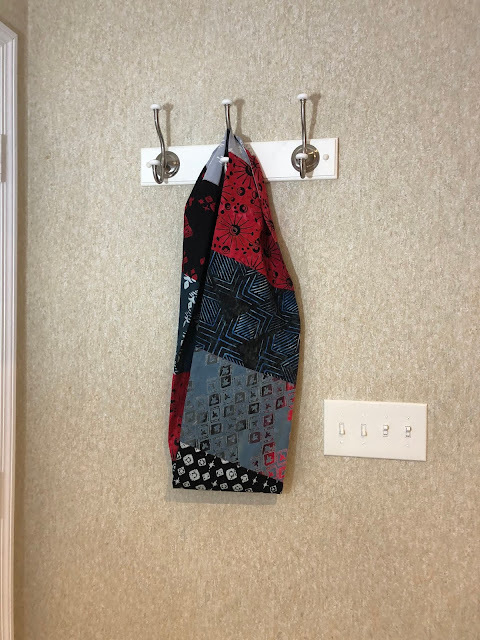 I made the same pattern, Share and Share Alike, but used the leftover border fabric for half of the blocks and the leftover backing fabric for the other half. Scraps from the blocks are in each block. 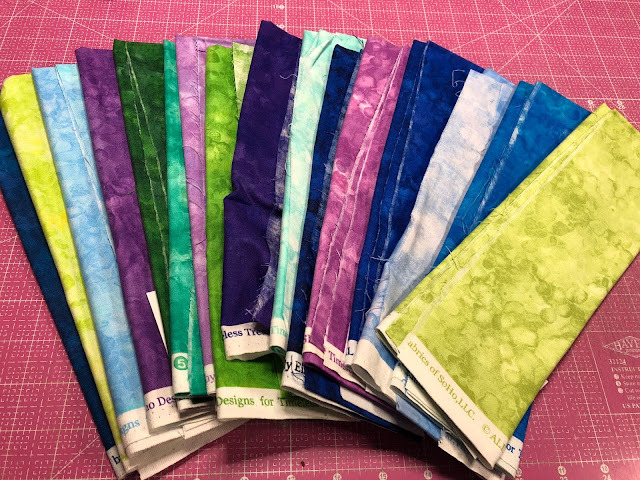 I pulled some fabric from my stash collection for the borders and backing. I quilted it using my go-to FabuLux Giggle thread. And did I make space on the table? Some. I think I need to deal with the fabric behind the rotary cutter next. Hmmm..... which Cutie Pattern shall I use? Scarves to Share? The time of year when I'm done traveling and tell myself "I really shouldn't drink so much soda pop." Let the great Detox begin! 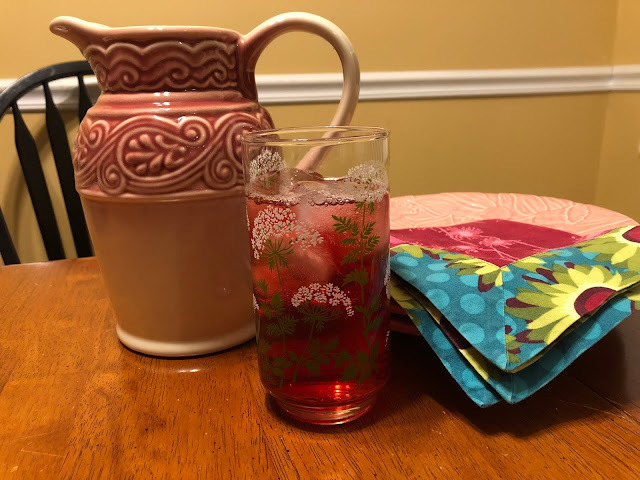 When I was teaching at The Quilter's Studio in Fairfax, VA last week, a student brought me a drink from the restaurant next door -- Red Medicine from First Watch. It was DELICIOUS! I'm going to try drinking this when I have an urge to drink Diet Dr. Pepper. Steep the tea bags in the water and add the honey while mixture is still hot. When cool, add juices. Serve over ice. I feel the need for another Sweet Tooth Cutie Quilt every few weeks. 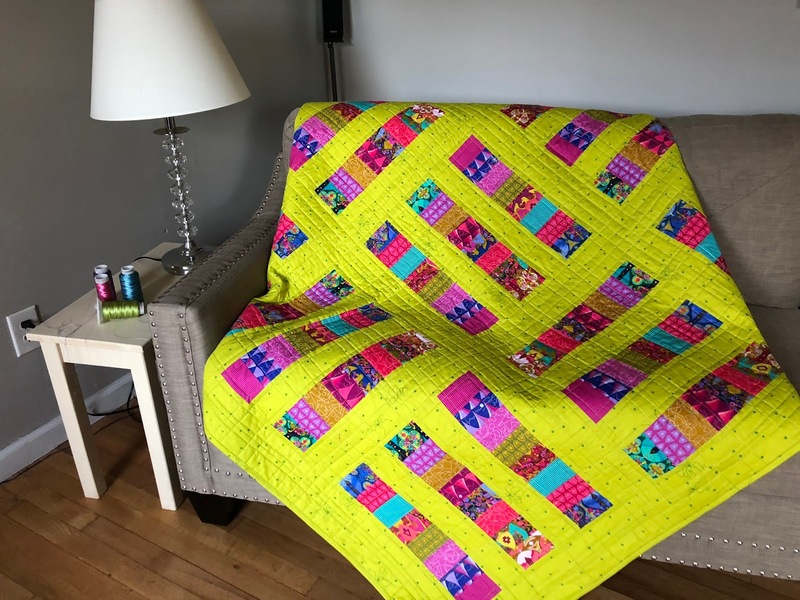 Doesn't this whole quilt look like spring? I took this photo on one of the last sunny days of autumn and will keep looking at this picture throughout the dreary winter to remind me of sunnier days. 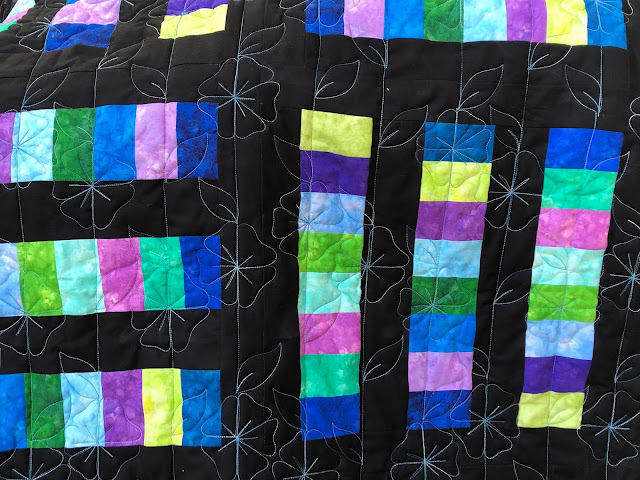 The ribbon candy quilting is probably one of the reasons I love this quilt so much. The 1" Ribbon Candy stencil is a favorite of my students! My Day on Jenny Lyon's Blog Hop! 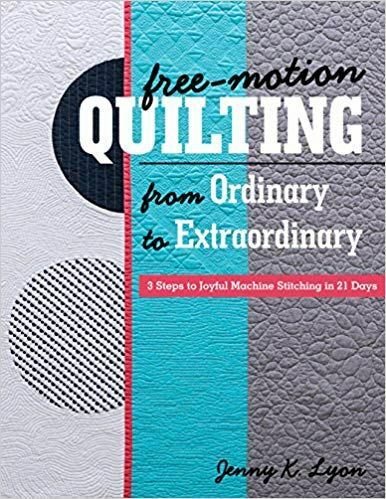 I'm so excited to share a fellow machine quilting teacher's new book! 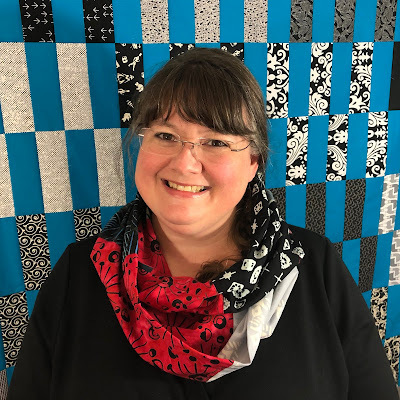 From my decade of teaching machine quilting, I know that there are many different quilters, quilt teachers, and ways to learn machine quilting. Jenny and I quilt and teach differently and I am tickled to share Jenny's book with you. My favorite part of her book was when she described quilted postcards as "a great place to try new free-motion quilting ideas... with minimal investment in time and materials". I couldn't agree more! Many quilters make too much of practice. They think it has to be an entire scrap quilt or at least a fat quarter-size quilt sandwich. Not so! It can be a small postcard. Let that postcard make you happy and then send it through the mail to deliver love to someone far away. 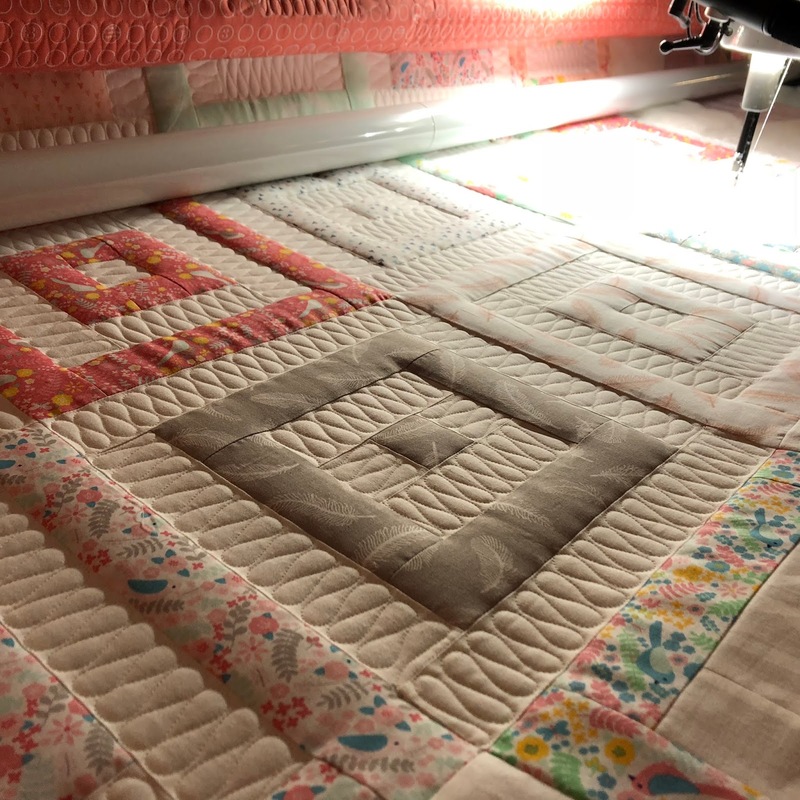 Jenny calls her quilting "Plactice" to combine "Play" and "Practice." I couldn't agree more! I recently sent a little Hanukkah love through the mail. 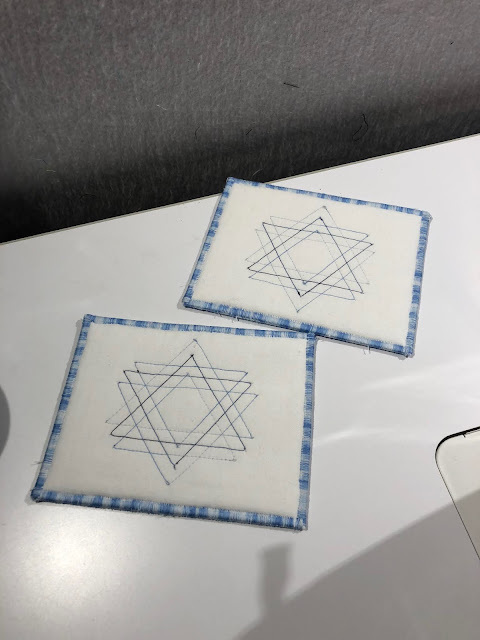 I stitched a Star of David in two different threads (variegated blue and variegated gray) on white fabric over cotton batting. The fabric is wet because I took the photo right after I removed the markings on the fabric. Then I fused it to a double-sided fusible stabilizer, added a plain white backing, trimmed using my Postcard Trimming Tool, and zigzagged the edges with FabuLux Blue Heaven thread. I make a lot of postcards and send them in cellophane envelopes so they are clean when they arrive at their destination. I must confess that my Hanukkah cards arrived a day late because I lost track of the calendar. I haven't started making my Christmas cards yet and won't guarantee that they'll be on time. Even late, no recipients have ever complained about receiving a lovely card in the mail. So, do you want a chance to win Jenny's book? Leave a comment here on my blog saying what your favorite thread is. If your ID doesn't link back to you, please leave a valid email address or way to contact you. I will choose a winner on December 14, 2018. – You can enter each day but can only win once. – Jenny will send winners a signed copy of her book. The more the merrier-feel free to pass my post on to others so that we can all play along. It’s that simple! Now, won’t you play along? Click on the appropriate link for the day, make a comment, and you’ll be in the running to win a free, signed copy. Wouldn’t that be nice to snuggle up with Jenny's as we enter the winter months? My new year starts when the last trip of the year is over. Which is now. Today, actually. I love everything about New Year, especially a new planner. I'm a Bullet Journal fan, so I make my own planner. I bought blank notebooks online and each becomes whatever I need it to be. 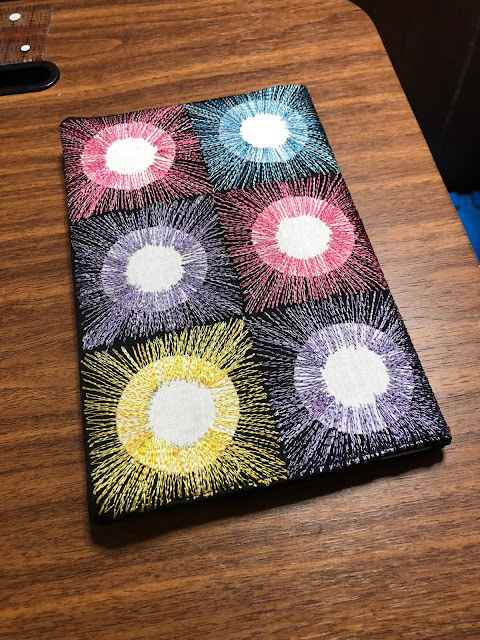 Blank notebooks are boring and I'm a quilter, so I made my own planner cover when I was under the weather last week. Want to see it? Yes, I'm teasing. 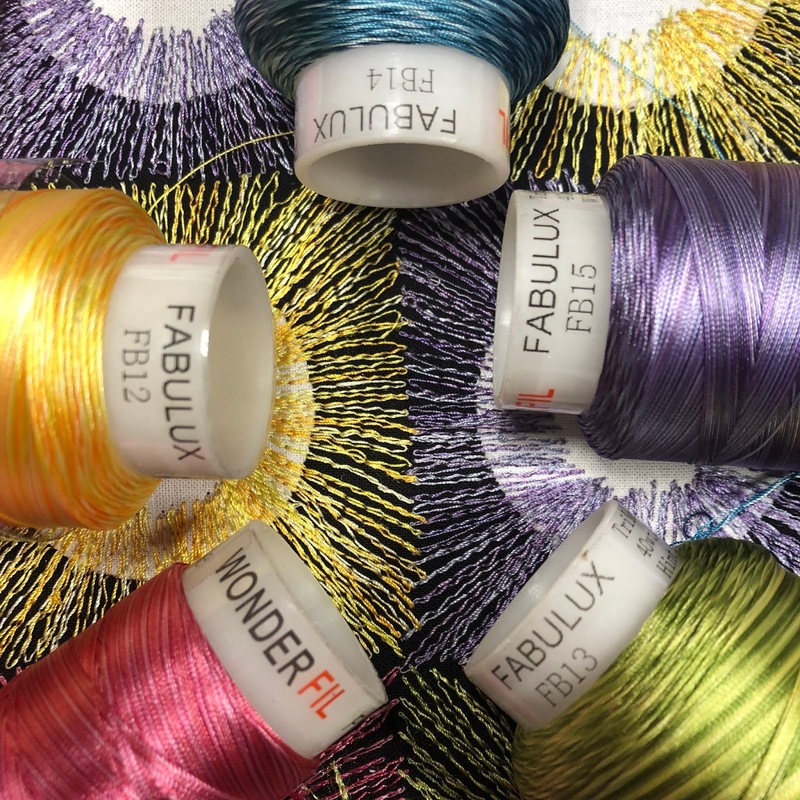 I pulled out five different FabuLux threads and started playing with my Handi Quilter Stitch 510 machine. 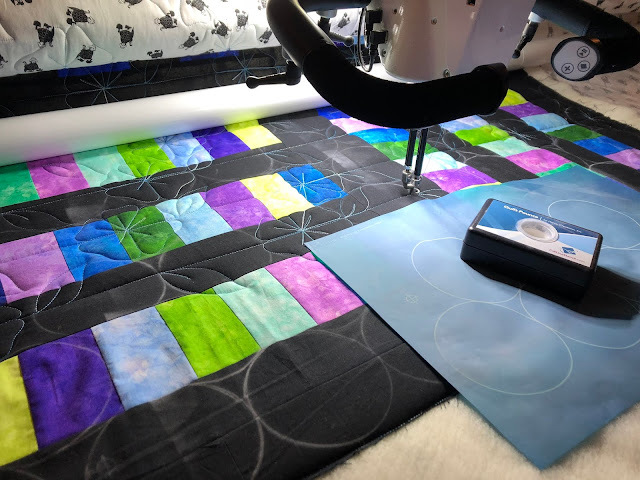 This is the first time I ever converted the foot and plate for free-motion quilting. Why did I wait so long??? These circles were inspired by a garment stitched by the incomparable Gilbert Muniz. While I'm always happen when using my planner, I think this cover is going to make me even happier! Did you know that there is a sampler pack of the threads that I used in this project? Check them out HERE. If you want to know more about bullet journaling, Dot Journaling is a good book to read to get started. I also found someone's blog post about what they wish they knew before they started their bullet journal. Read it HERE. Happy New Year and Happy Journaling! In case you didn't know it, I'm a productivity geek. I love to find little tricks and fixes to help me be more organized and get more done. Going into an office supply store is more tempting to me than a fabric store and a new yearly planner makes me weak in the knees! 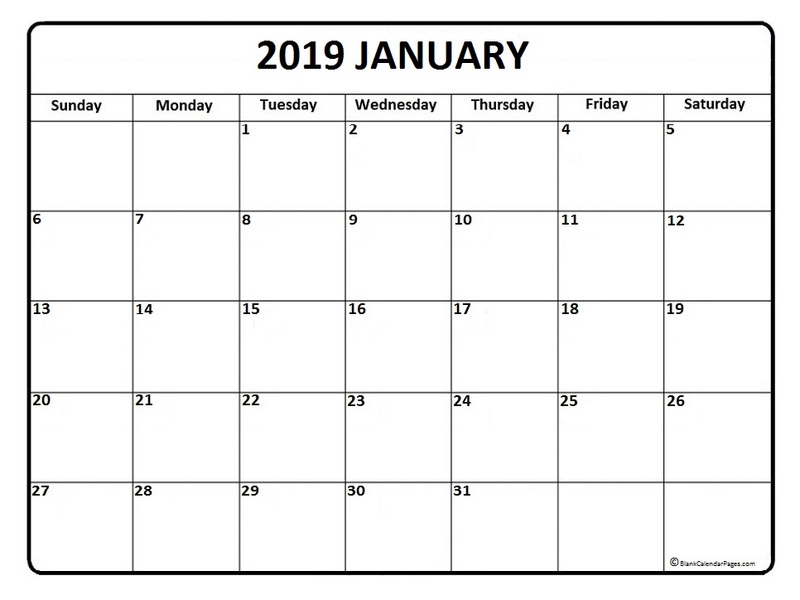 New Year is my favorite time of the year because I get to start everything over again, but my New Year starts this week because today I am returning from my last teaching trip of 2018. I leave again in February, so I try to make the most of the 6-8 weeks I'll be home by celebrating New Year early. I just finished reading (listening to) The Productivity Project by Chris Bailey. I listen to books while quilting, driving, and working around the house, so basically I listen nearly all of my waking hours. This young man spent a year testing out different factors of productivity (sleep, food, solitude, etc.) to learn what impacted his productivity the most. Sprinkled throughout the book are titles of other productivity books. I've read some and plan to read the rest. I can, without risk of exaggeration, state that this book Changed. My. Life. I re-read it at least once a year, sometimes more. I read this book once, years ago. My memory is that it was light on substance and can be summed up in one sentence: "Do the most important task of the day first"
Haven't read it. It's now on my list. This book was eye-opening for me. It was the first time I considered that doing everything myself wasn't always the best use of my time. This book made me realize that habits can be good as well as bad. Watching this 6-part documentary is now scheduled as a series of date nights with my husband. Because we are a wild and crazy couple. This is a great book and brilliant audiobook by the man who brought me my favorite TED talk... EVER! The Rule of Three -- Three goals for the day, three goals for the week, three goals for the year. The author has additional resources on his website. While The Productivity Project didn't rock my world, it was a great start to my upcoming Year of Productivity (what I name every new year). Do you have other favorite productivity books that didn't make this author's list? One of my weirdest (and best!) reads is Work Clean. Seriously, your work life is like a kitchen. Read this book. The very first Cutie Pattern I designed was Squared Away. This is one of my very favorites for that reason. 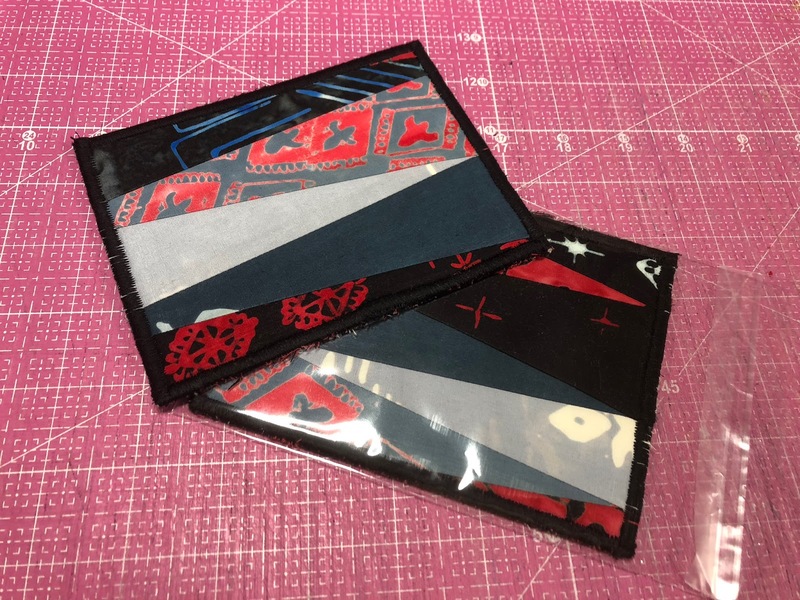 I also love it because it requires no border yardage so I can use my precious fat quarter packs. 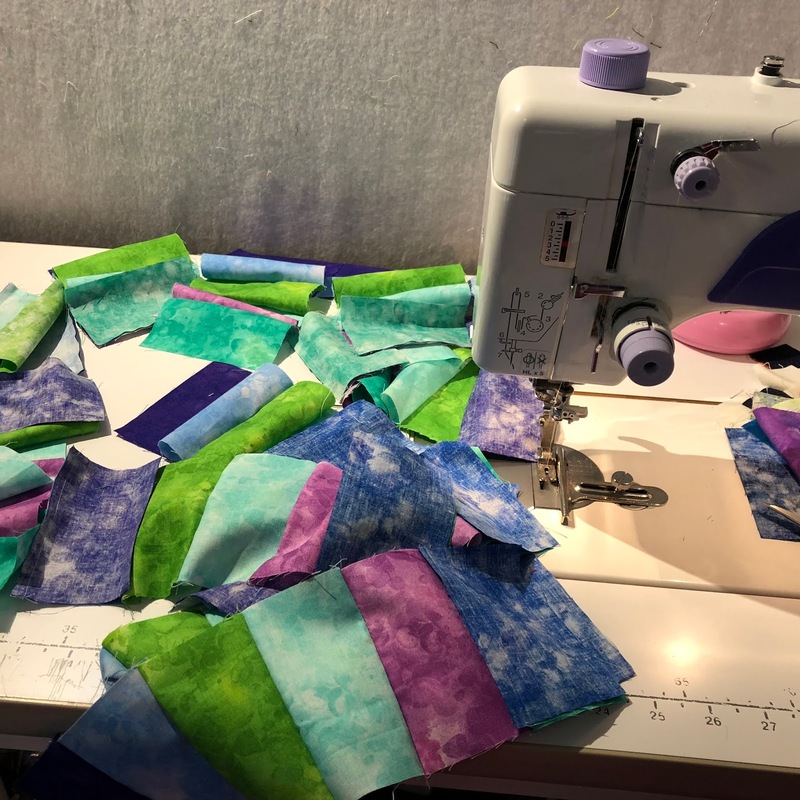 It is also super-fun to quilt! 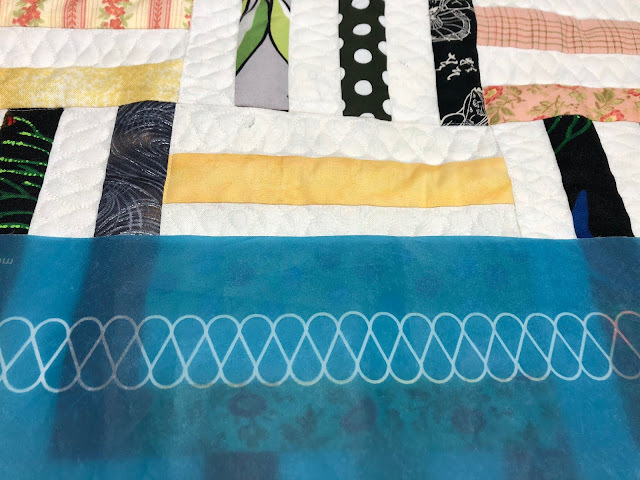 The areas of alternate ribbon candy quilting plus the wool batting make this a true joy to quilt. If ribbon candy isn't your specialty, try using my 1 1/2" ribbon candy stencil. This fabric is called Dreamfield and I've been hoarding it forever. It looks so great in this quilt. 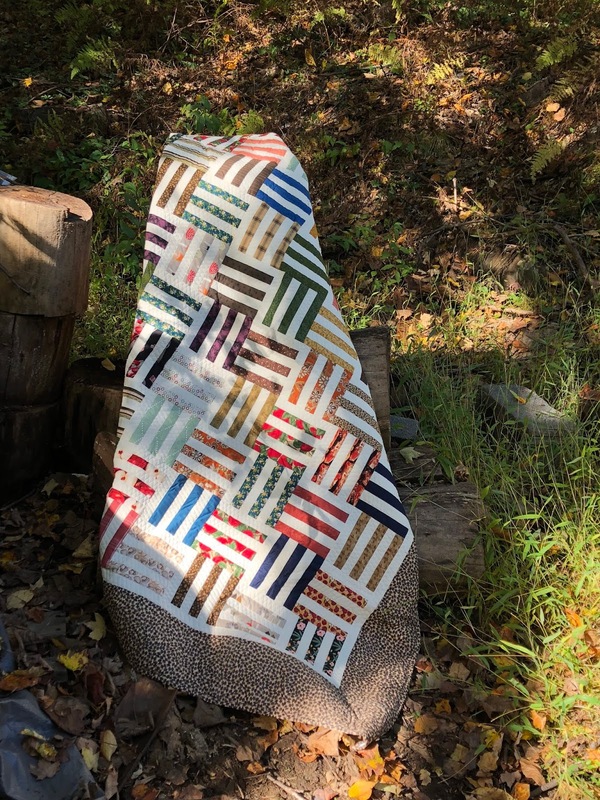 I already gave this quilt away and it is being loved by a lovely friend of mine. 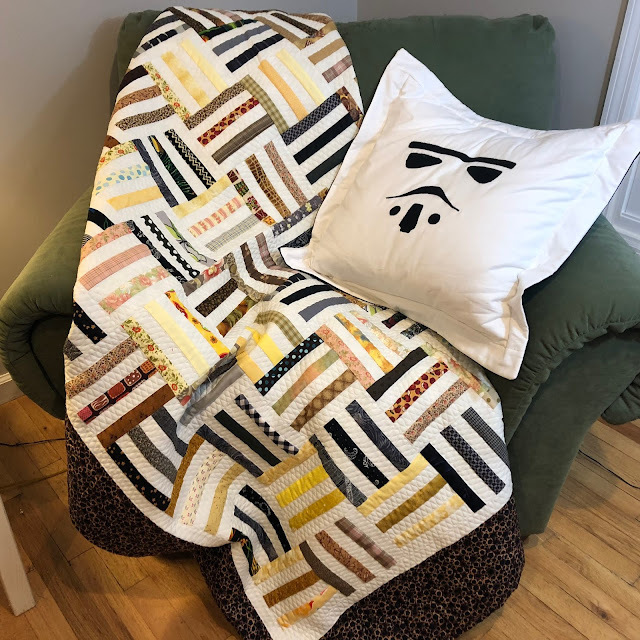 I can't count how many Sweet Tooth Cutie quilts I've made; the number is certainly higher than my fingers and toes can handle. 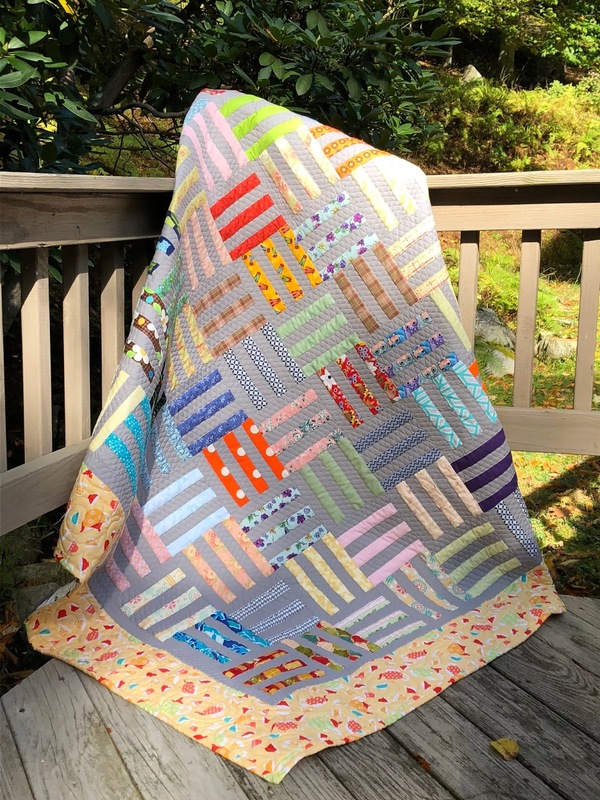 There's something about the skinny strips and alternating ribbon candy stitching that makes this quilt bring joy to my heart. 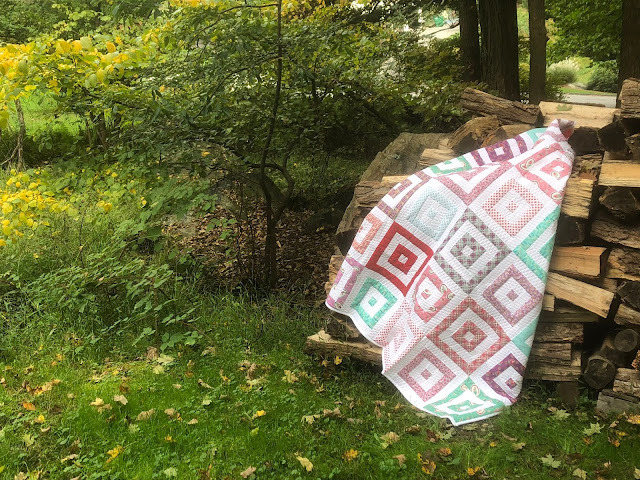 Maybe if I cover up my entire wood pile with quilts, it will split itself and stack itself into neat little piles? What are your feelings about ribbon candy? I'm in LOVE and very comfortable quilting it in all directions. My students asked for a stencil to help them with their ribbon candy, so I happily obliged. 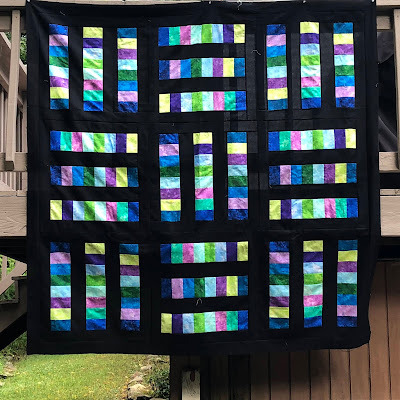 I use a 1" ribbon candy stencil for this quilt. I loaded up my Handi Quilter Forte, grabbed some FabuLux Blue Heaven thread, my 4" Offset Circle Stencil, and a good audiobook and quickly turned this quilt top into a pretty and fluffy and warm and lovely quilt. I hope you like "autumn in the woods in New York" backdrops for photographs, because that's my default. And I need to get out there and finish splitting that humungous pile of wood soon! 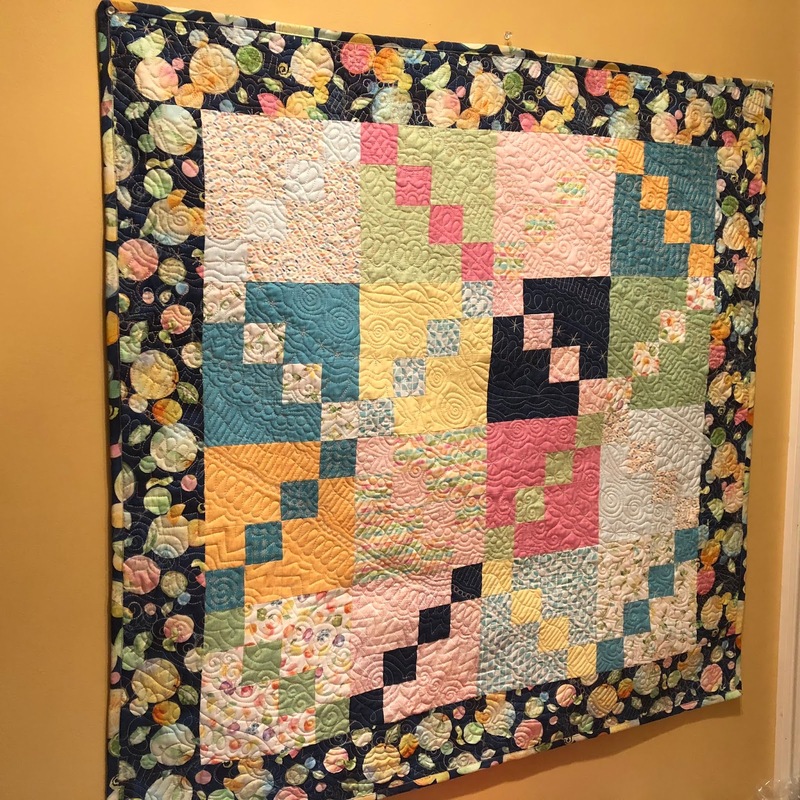 While there is no ribbon candy stitched anywhere on this quilt and I feel kind of empty inside because of that, the ribbons of flowers and leaves lightly dancing on this quilt top make me oh So HAPPY! I teach this techniques in one of my Craftsy classes and often in my in-person classes as well. Sign up for my mailing list to see where I'll be teaching. 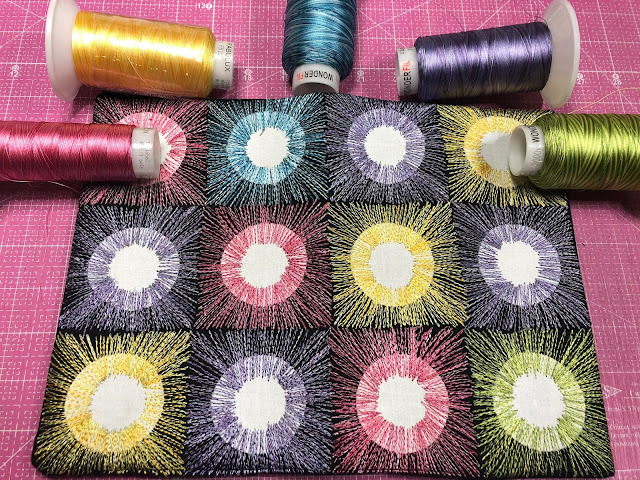 Do you engage in happy sewing when you are feeling icky? 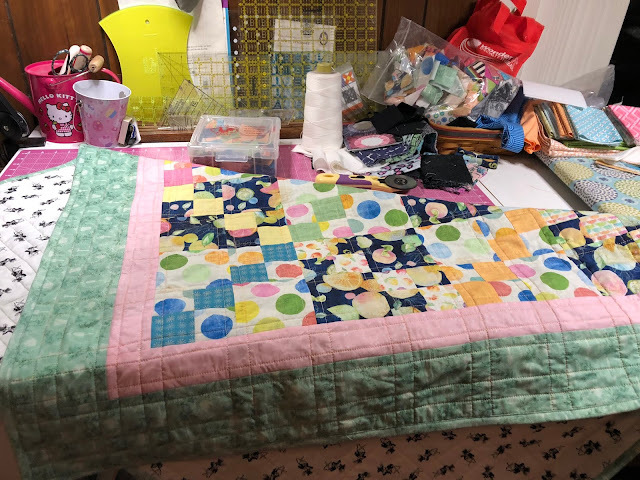 It's my favorite medicine because the quilting helps the icky times pass more quickly and then I have a pretty quilt at the end to give away to someone else who is feeling icky. 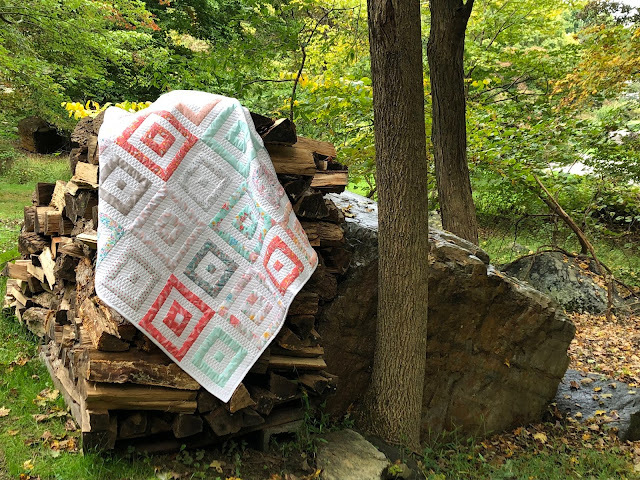 The bright colors of this Squared Away Cutie Quilt shone on the dreary autumn day. I live in upstate New York and I will put our autumn colors against anywhere in the world, but dreary days are dull everywhere. 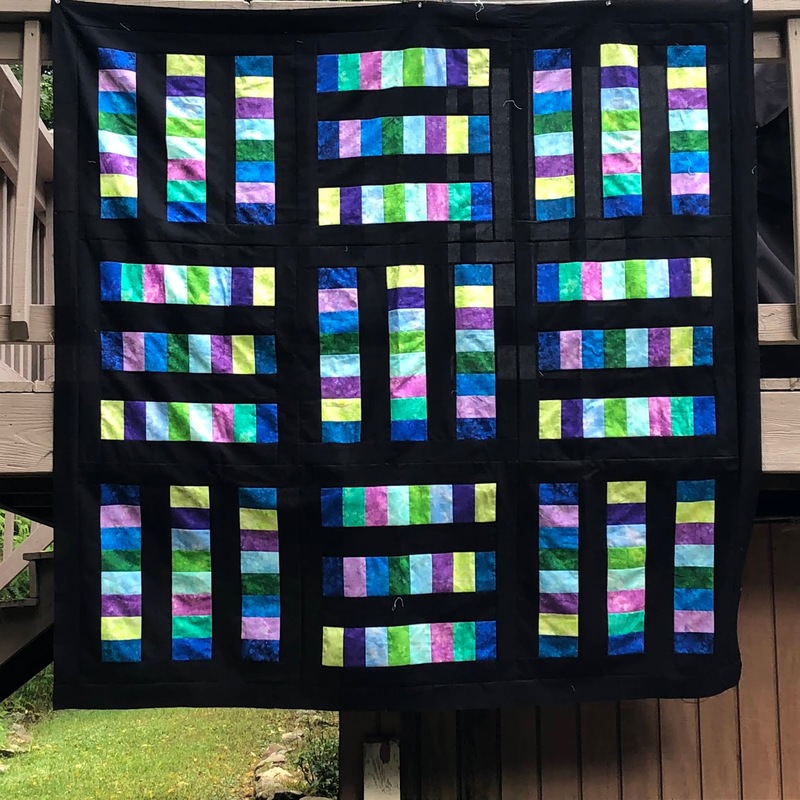 The ribbon candy quilting makes this quilt. If you aren't a ribbon candy expert, try using a stencil. This quilt uses the 1 1/2" ribbon candy stencil. I admit that I am hopelessly in love with Cuties and Cutie Patterns. I usually grab my "bright" Cuties to make my first copy of a new pattern and they look great in this pattern! I have my eyes on a stack of red/white fabrics, neutrals, blue/yellows, and black/white/neon pink. Do you subscribe to Quilter's World Magazine? I write a machine quilting column in each issue. The Winter 2018 issue is ready and my article "The Inside Scoop: Edge-to-Edge Quilting" is on pages 82-84 (for your convenience). Have you ever wondered the stitching order for an all-over pattern on a quilt on your home machine? 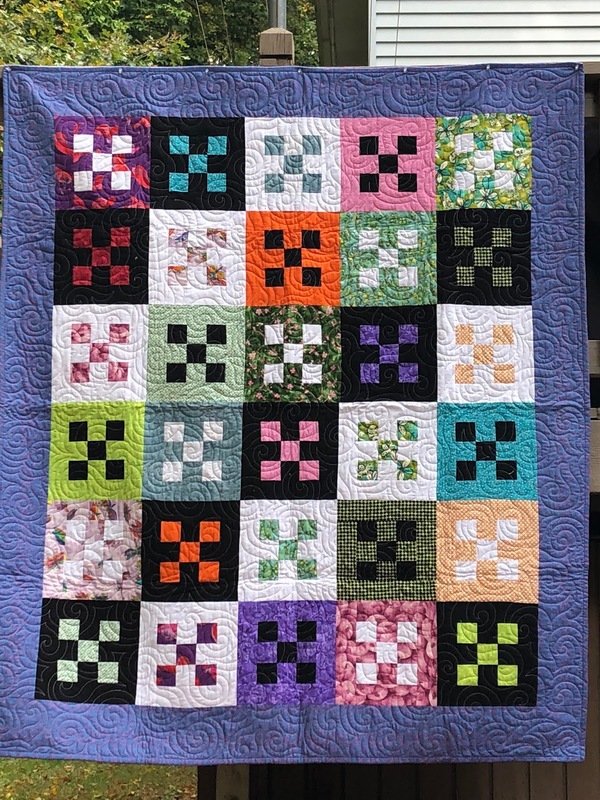 Let me know if you have any quilting questions that I can address in future columns. In May, I attended Quilt Market in Portland Oregon. While I was there, I made mischief with Teri Lucas, ate Salt and Ice Cream, and filmed an episode for Annie's Creative Studio featuring New Tools! Sign up for your Annie's Creative Studio Free Trial and check it out! I finished one of the quilt tops I pieced during my month of recovery from medical treatments. 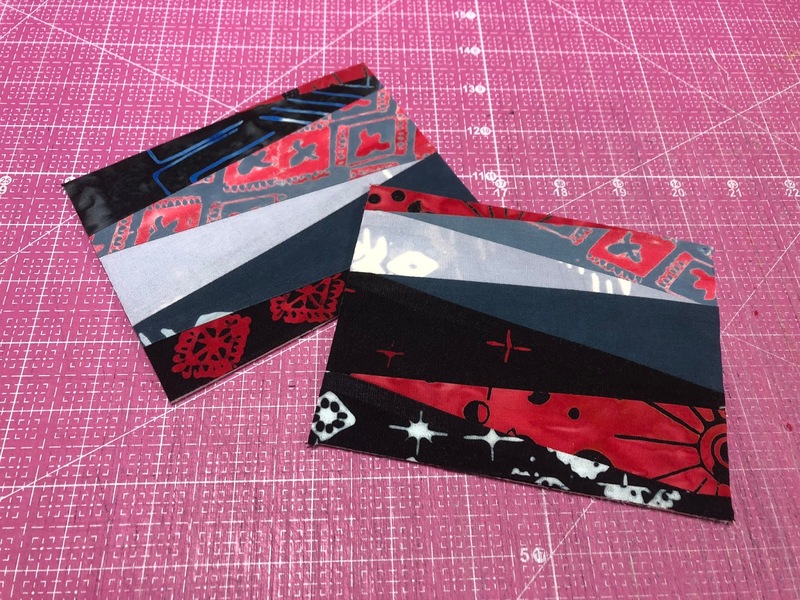 Did you know that I have stencils that can help you stitch accurate 1" ribbon candy? 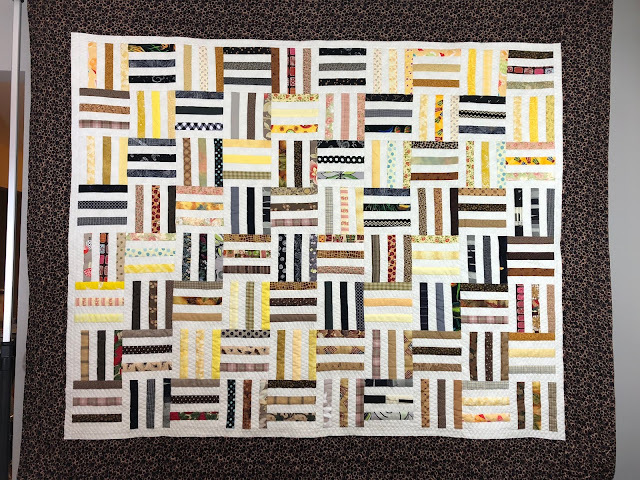 I used Quilter's Dream Wool batting and it really makes the unquilted strips POP! 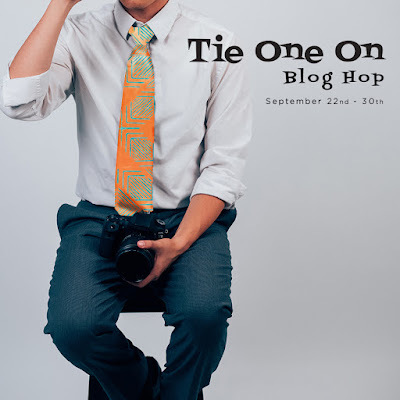 Today is my day on the Tie One On Blog Hop! My super-talented friend, Scott Hansen of Blue Nickel Studios, designed a wonderful line of batik fabrics for Banyan Batiks/Northcott, inspired by vintage men's ties. Watch an interview I did with him about his Tie One On line HERE. If I had to describe this fabric line in one word, I'd choose "wearable." 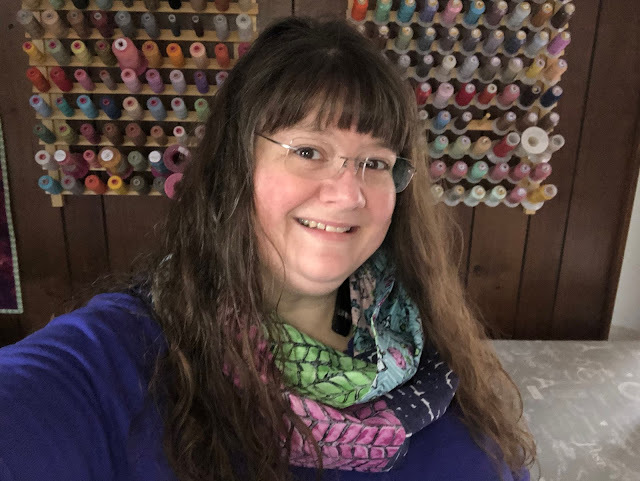 They are so wearable that I decided to make an infinity scarf using these fabrics and my Scarves to Share Cutie Pattern. I love that red print so much that I used it twice in this scarf. The weather is turning to fall here in upstate New York, and that means boots and sweaters and scarves. I have my first new scarf of the season ready to wear! And wear it I did! Now these lovely men's wear fabric postcards will spread a little message of love through the mail. I'd love to see that look come back! Did you know that every stop on the blog tour is giving away a bundle of Tie One On fat quarters? To enter to win Scott's fat quarters from my blog, please leave a comment telling me your favorite men's wear look. Comment until October 2. I'll pick a winner on October 3. Visit every stop on the blog tour for more chances to win fat quarters of Tie One On! 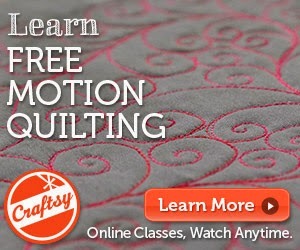 Be sure to sign up for my newsletter HERE for more quilty goodness delivered right to you! Tomorrow is the beginning of the Tie One On! blog hop celebrating Scott Hansen's new fabric line. 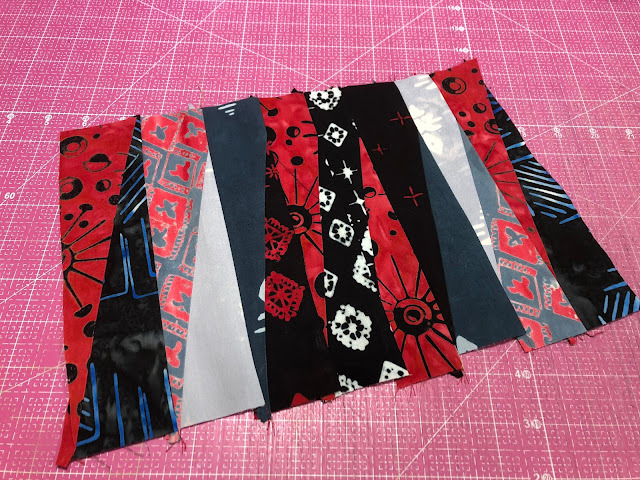 I am hard at work making something just for me using this amazingly wearable fabric and will show it to you next week.